Transportation accounts for about 44 percent of Washington’s total greenhouse gas emissions, according to state-compiled figures that include personal vehicles, commercial trucking and marine traffic. In Idaho, on-road transportation is responsible for nearly 51 percent of the state’s greenhouse gas emissions. Off-road transportation, including planes, trains, snowmobiles, boats, forklifts and lawnmowers, is responsible for another 8.6 percent of Idaho’s greenhouse gas emissions. Eight years ago, Geoff Carr and Mollie Murray’s 2003 Kia Spectra was totaled in a parking lot collision. They sold it for scrap, and their driveway has been empty ever since. The couple and their young daughter commute by foot, bike and bus. Relinquishing car ownership isn’t a practical choice for everyone, the Coeur d’Alene family acknowledges. But they think many Inland Northwest residents could integrate car-free trips into their lifestyle with minimal fuss. “A lot of it comes down to planning,” said Murray, 33. When they bought a house, the family looked for a residence within 2 miles of North Idaho College, where Carr, 37, is a journalism instructor and Murray is studying environmental science. Their house is a 30-minute walk from the college and 15 minutes from Sorenson Elementary School in downtown Coeur d’Alene, where their 7-year-old daughter, Viva, will be a second-grader next fall. The family’s walking commute takes them past a Safeway, where they stop several times per week to pick up groceries. About three times per month, they take the bus to Costco to stock up on larger items. “We couldn’t do it without backpacks,” said Carr, who frequently lugs around 20 pounds in his day pack. During warm weather, he rides his bike, which has a trailer for hauling things. And some bulky items, such as toilet paper, are easier to purchase online and have delivered to the house, he said. Carr and Murray are an anomaly in the auto-centric Inland Northwest. Each day, drivers travel about 10 million miles on Spokane County’s road system and more than 2 million miles in Kootenai County. The figures, provided by the states, are calculated slightly differently: Spokane County’s figure includes all public roads; the Kootenai County figure is only for state-owned roads and highways. In contrast, Murray walks 5 to 7 miles daily. Carr walks about 9 miles daily, less when he’s riding his bike. And their budget benefits from not paying car insurance, auto repair bills or filling the tank with gas. “We saved enough that I could be a stay-at-home mom for six years,” Murray said. “When gas prices go up, it’s not one of our concerns,” Carr said. The couple cited the environment as their No. 1 reason for giving up their car, “though we don’t do a lot of other green stuff,” Murray said. “We have a big-screen TV,” Carr said. Each gallon of gas they aren’t pumping into a car keeps about 19 pounds of greenhouse gases out of the atmosphere. Personal auto use accounts for about 25 percent of the average American’s carbon footprint, according to the Union of Concerned Scientists, a nonprofit research group. At times, Carr misses the convenience of hopping in a car to drive to Spokane for concerts and other events. The family spends most of their free time in Coeur d’Alene. And, they expect to re-evaluate car ownership when their daughter is older and involved in extracurricular activities. “We’re not so deluded to think that one family not having a car is going to change the world,” Carr said. But the couple likes to think they’re modeling middle-class existence without a car. “There’s not that many people like us – people who choose not to have one,” Murray said. Kitty Klitzke, of Spokane, spent a decade without a car. She credits the bus service in her former Browne’s Addition neighborhood for allowing her to give up vehicle ownership. The bus came at 15-minute intervals on weekdays, which made it easy to get to her job downtown and to the Spokane International Airport for business trips, said Klitzke, the Eastern Washington program director for Futurewise, a statewide nonprofit that promotes sustainable growth. 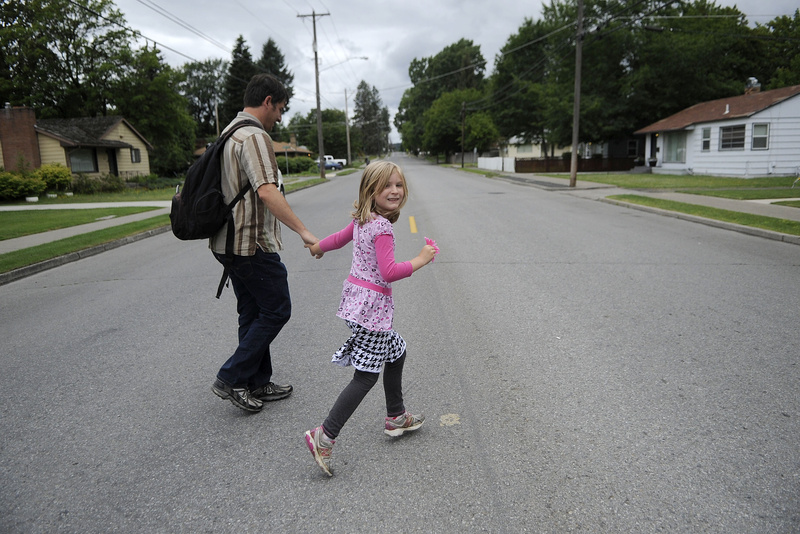 Not having a car encouraged her to explore her neighborhood, Klitzke said. With so much to do within walking distance, she didn’t miss going to other places. And she used the savings from not driving for international travel. Now married and living in the West Central neighborhood, Klitzke, 37, resorted to driving over the past year to get her infant daughter to day care. Though the day care was close, walking required travel on busy streets without sidewalks or safe crossings. She’s been driving her husband’s Subaru, dropping him off at work before heading to the day care, then driving herself to work. She’s racked up fines from parking tickets, too. With her husband threatening to buy a second vehicle to simplify the morning commute, Klitzke decided to move her daughter to the day care in her office building. Beginning next week, they’ll both ride the bus. Bus service was one of the perks of moving to Coeur d’Alene four years ago, Carr and Murray said. Before, they lived in a small town in Georgia, without public transit and few bike lanes. In comparison, Coeur d’Alene is “like living in Amsterdam” – a city known for its pedestrian access, bike lanes and transit system, Murray said. The vast majority of North Idaho drivers are courteous, too, the couple said. Friends and strangers have pulled over, wondering if they wanted a ride. “Usually, the answer is ‘No,’ ” Carr said.